Low performance, high price. A really good office laptop is available for 650 Euros (~$878), just like the ATIV Tab with a keyboard dock. Can this concept of an ultra-mobile work and Internet station succeed at this price? 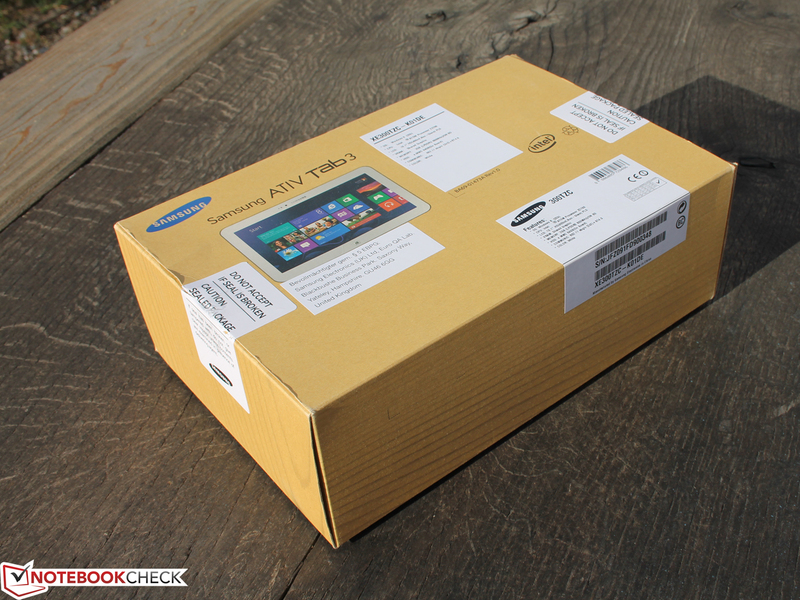 Samsung ATIV Tab 3 + KeyboardDock: The perfect combo-tool for mobile Windows workers? High performance, low price. A majority of technophile buyers scan the market to find their next gadget following this motto. There are now innumerable Windows tablets on the market, including performance-oriented ULV systems featuring standard subnotebook processors. Users who think along these lines can stop reading here. The present test system is based on Intel's first tablet-processor generation, Clover Trail. 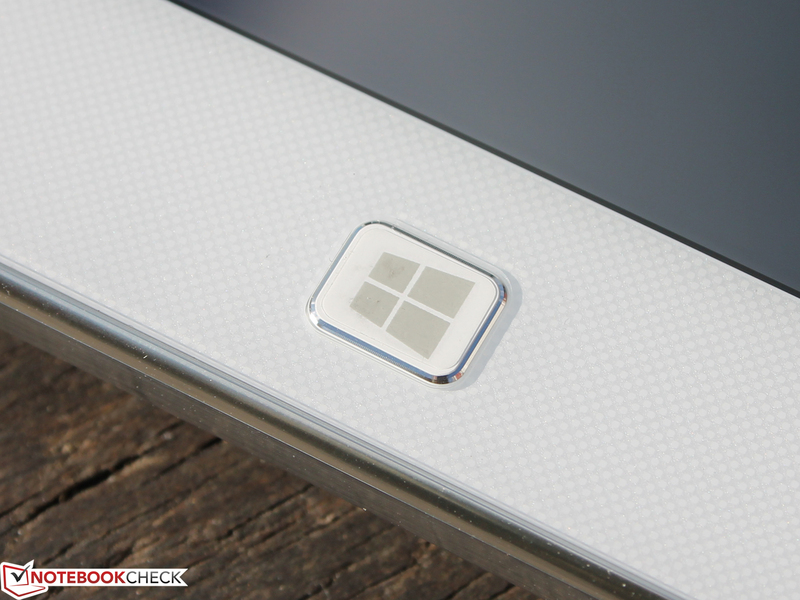 The successor dubbed Bay Trail is now, (late 2013), expected in the first regular Windows devices. The performance of the ATIV Tab 3 is thus only sufficient for basic office applications, as we have proved in many reviews. 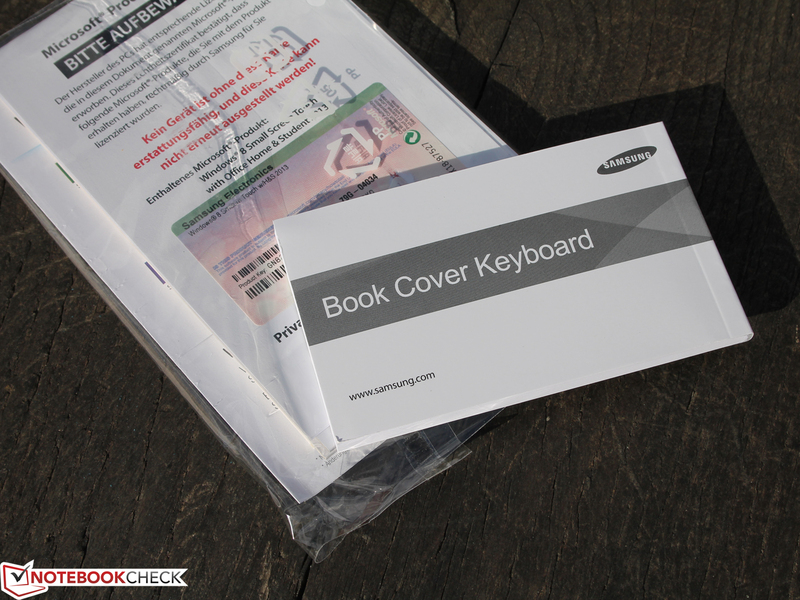 Samsung is quite late with its ATIV Tab 3, which is bundled with a surprisingly good Book-Cover keyboard in our case. But how is the steep price of 679 Euros (~$917, tablet) + 90 Euros (~$122, keyboard) justified? For this sum, users could buy a very good office laptop that is naturally not as handy and portable, but which features a much higher performance for Windows applications. 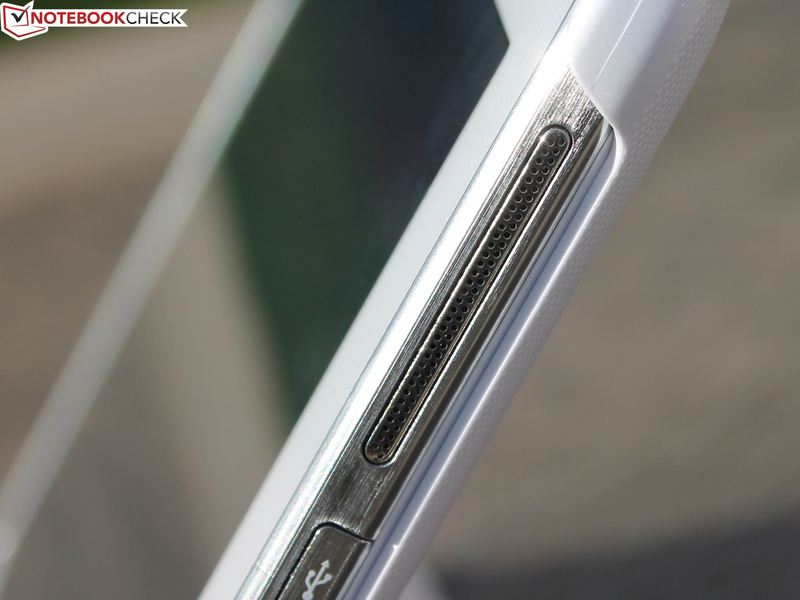 Has Samsung possibly packed highlights in the plastic chassis that will gain our favor? 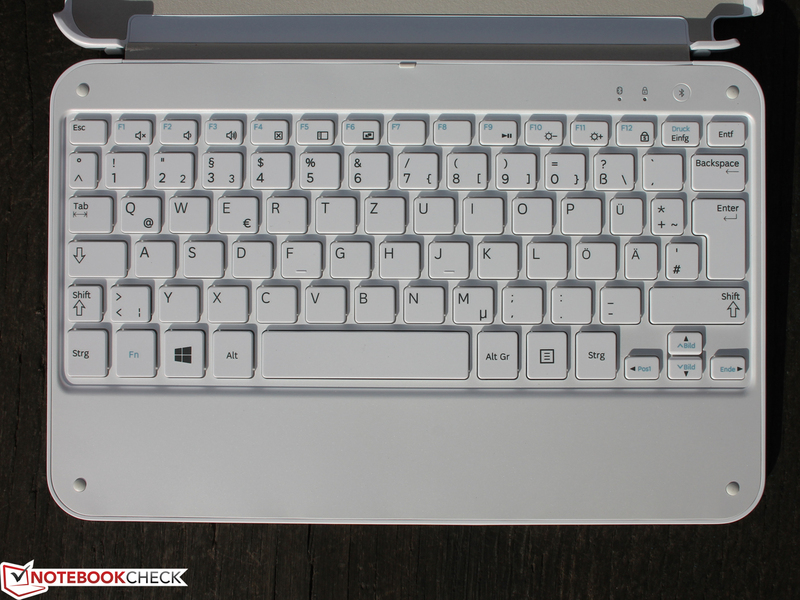 To classify it in the below 800 Euros (~$1080) market segment, we compared the review sample with the particularly low-priced Lenovo IdeaTab Miix 10 64 GB (Atom Z2760, 400 Euros, ~$540), which also includes a keyboard dock. The higher quality Lenovo ThinkPad Tablet 2 64 GB (Atom Z2760) with a digitizer is available for 650 Euros (~$878). We used Acer's Aspire P3-171 (550 Euros, ~$743) as a contrast in our performance comparisons. 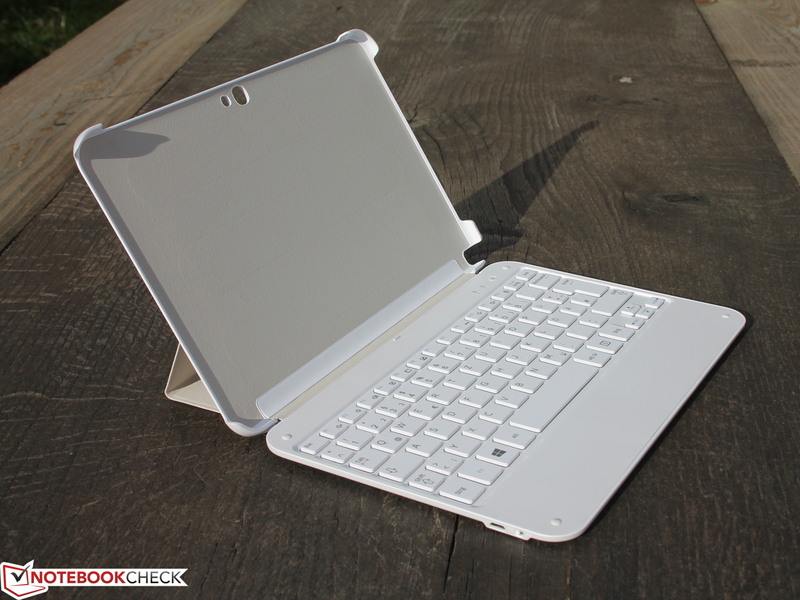 Although it costs less, it comes with an Intel Core i3 and a keyboard case. The 10-inch device is made of plastic, just like the metallic-looking, silver rim. The ATIV 3 does not win a prize in stability; attempts to warp it using both hands produced an audible creaking noise in the construction. The tablet is well built; all gaps are acceptable. 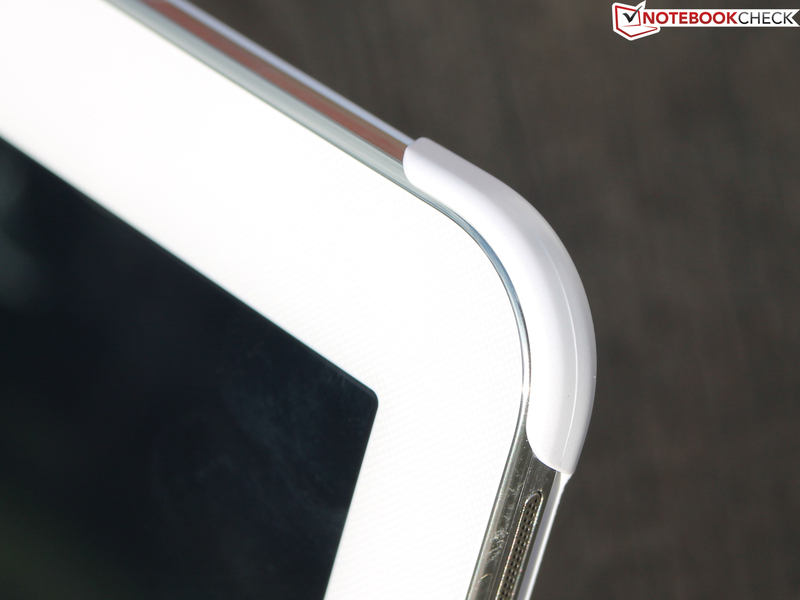 The white surface hides fingerprints perfectly and the polished back features small dots. However, they do not ensure a better hold; instead, they only serve the looks (anti-fingerprints). 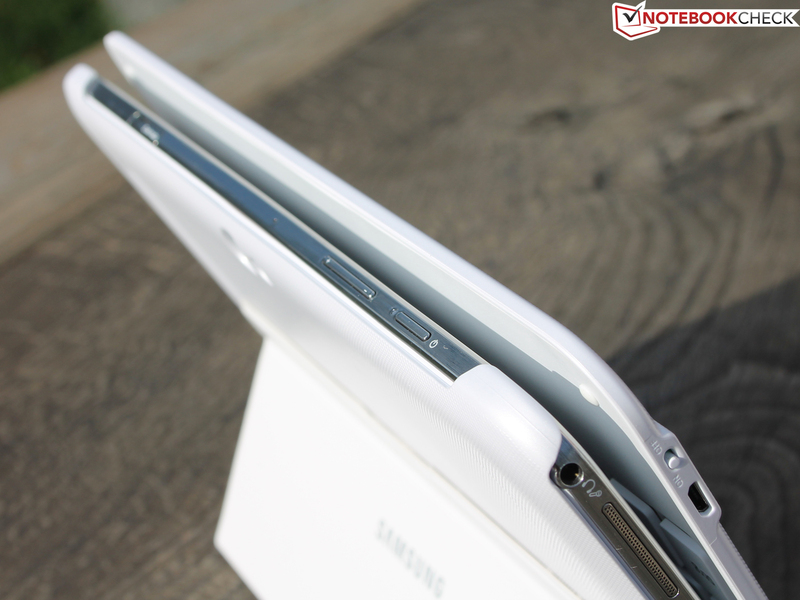 Thus, the back is sleek and the ATIV 3 could easily slip out of the hands. This cannot happen with the Book Cover keyboard. 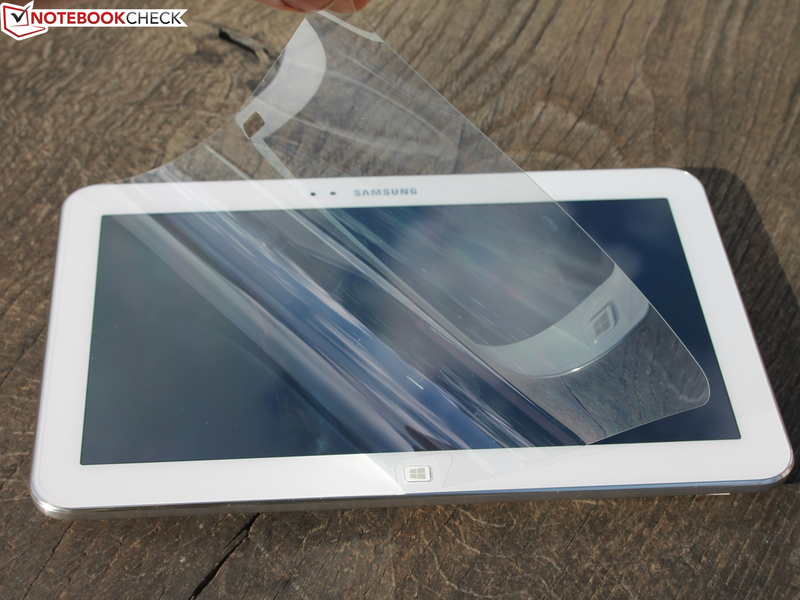 The tablet snaps securely into the securing edges and can be easily removed with a bit of bending. The plastic back has enough grip due to palpable dots. The same texture is found on the keyboard's underside. The "hinge" is made of artificial leather, just like the magnetic stand (two positions: upright approx. 100 degrees; flat 130 degrees). The whole thing is as big as a handy book when closed. However, it is quite heavy at 1046 grams (~2.3 pounds; tablet only: 546 grams, ~1.2 pounds). By the way, the tablet detects when it is closed and switches Windows to standby. Samsung rather neglected connectivity. Only one micro-USB 2.0 is available for connecting peripherals. Users who want to quickly connect a USB stick will have to fall back on an adapter, and when required a USB hub. The latter could surely have been included considering the price. It is worse for the IdeaTab Miix 10. The sole micro-USB port is needed for the keyboard dock and is thus unusable for other devices. 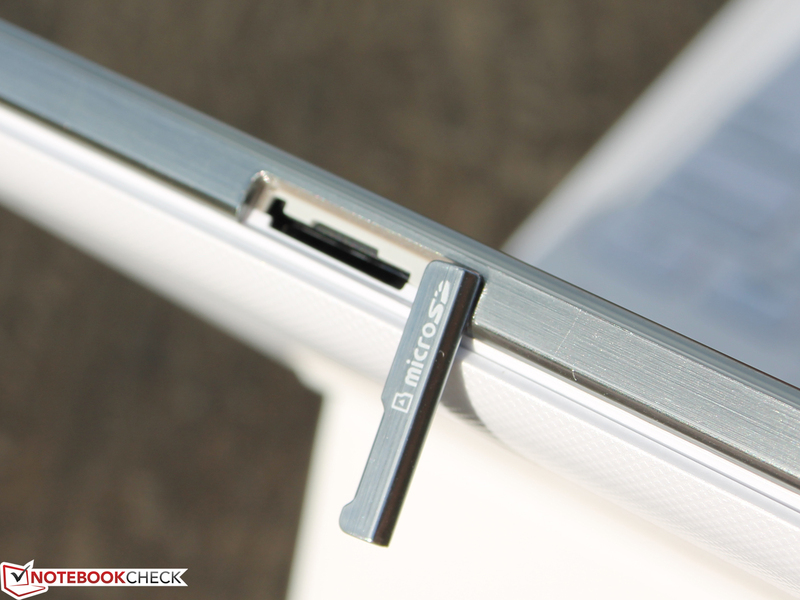 Lenovo's ThinkPad Tablet 2 and the Aspire P3-171 both sport a full-sized USB 3.0 port. 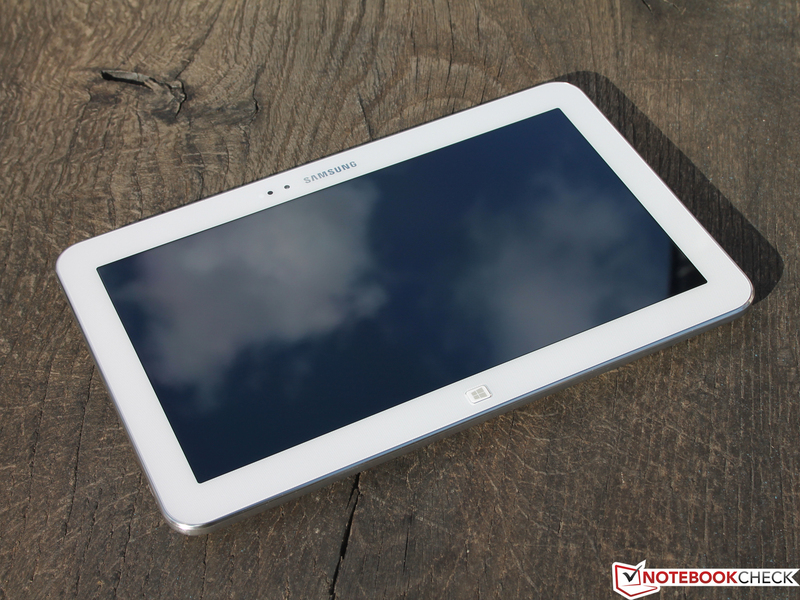 Samsung stuffs many applications in its ATIV Tab 3. Trial versions of MS Office 2013 Home & Student and Norton Internet Security (60 days) are preinstalled. They are followed by Samsung's tools, such as SideSync (smartphone screen on the tablet & vice versa, content sharing), S Note, S Player+, S Gallery, S PhotoStudio, S Camera+ and EverNote. Most tools are Windows adaptations of the Galaxy Android tools. For example, the brightness sensor can be disabled in the Settings tool. Hardware and software are scanned for problems via the Support Center. The Wi-Fi module did not transmit as flawlessly as known from many laptops in our non-standardized quick test. Nevertheless, the device managed two bars at the 15-meter (~49 feet) mark outside of the building. We could still surf in our browser here. Four of five bars were displayed in closer distances of three and ten meters (~9.8 and ~33 feet) indoors. The Bluetooth 4.0 module is essential for connecting with the keyboard or other devices. The camera modules' specs do not look awesome on paper and their poor picture quality is the final straw. 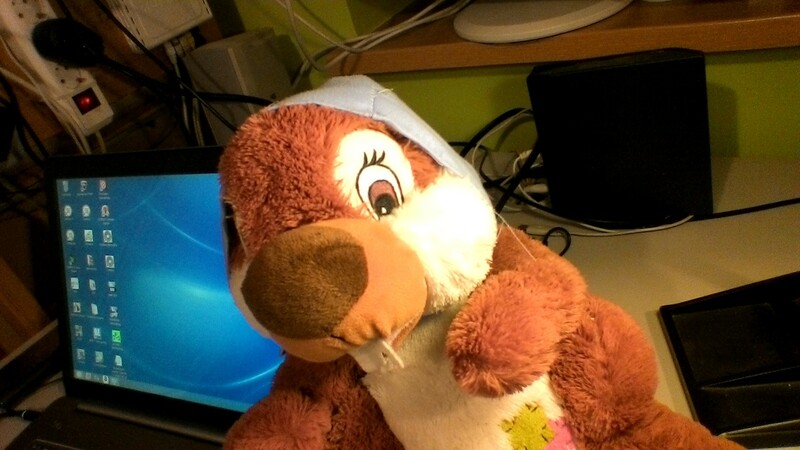 The front-facing camera with a resolution of at most 1280x720 pixels shows an intense noise. We see the same in the Full HD resolution primary camera on the back, which even has a flash. 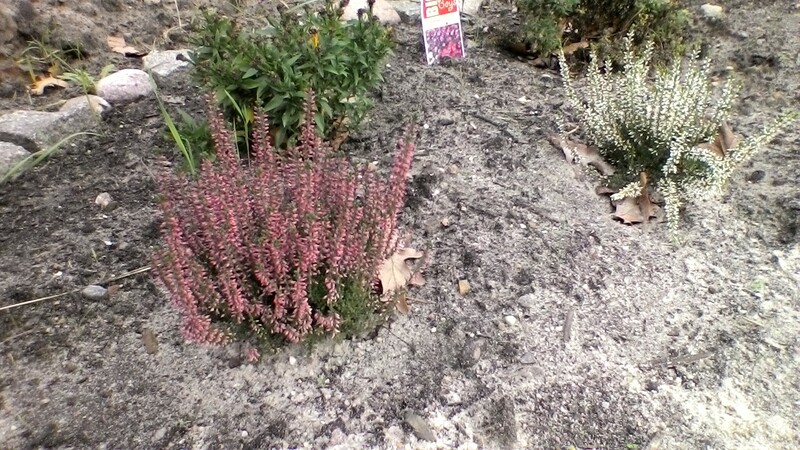 Although the primary camera's quality is not quite as bad as the front-facing module, picture noise (slight in daylight) and blurry outlines (poor focus) are daily fare. The speakers are located on the casing's right and left sides. Their fairly high volume is accompanied by lightly distorted trebles and not very differentiated mids. Of course, low ranges are non-existent. Headphones would be the option of choice here. There are two power supplies in the box; one for the tablet (40 Watts) and the other for recharging the wireless keyboard. 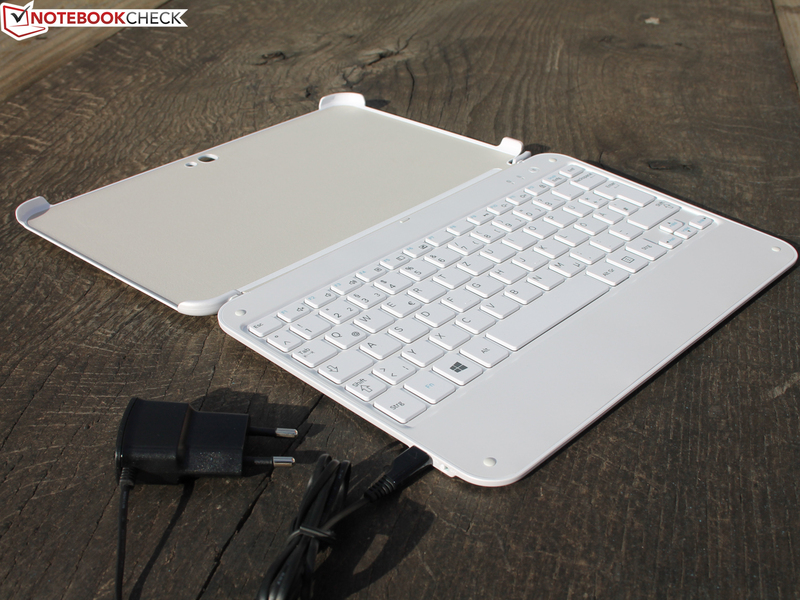 The keyboard dock (AA-BK1NWBW/DE) was included in our bundle, but the tablet can of course be bought alone. 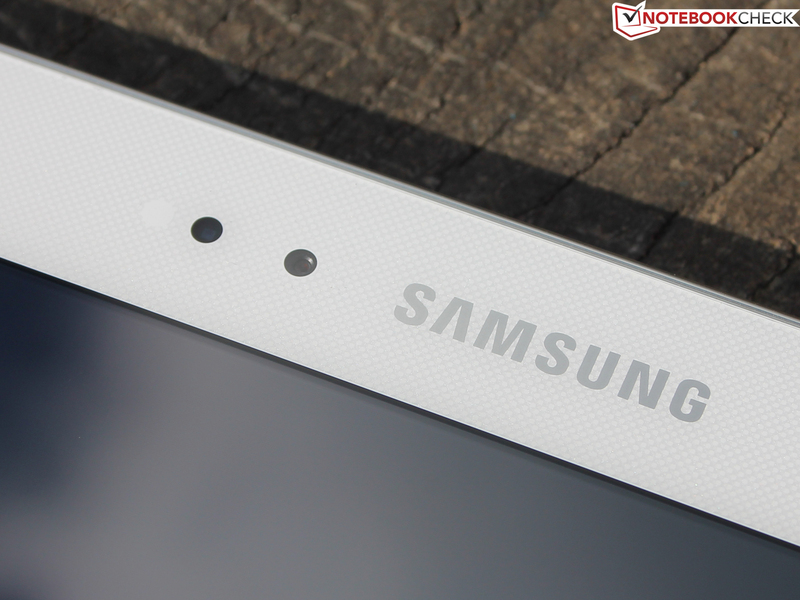 A stylus pen recessed in the casing is one of the ATIV Tab 3's most attractive features. Only the ThinkPad Tablet 2 used for comparison here includes one as well. 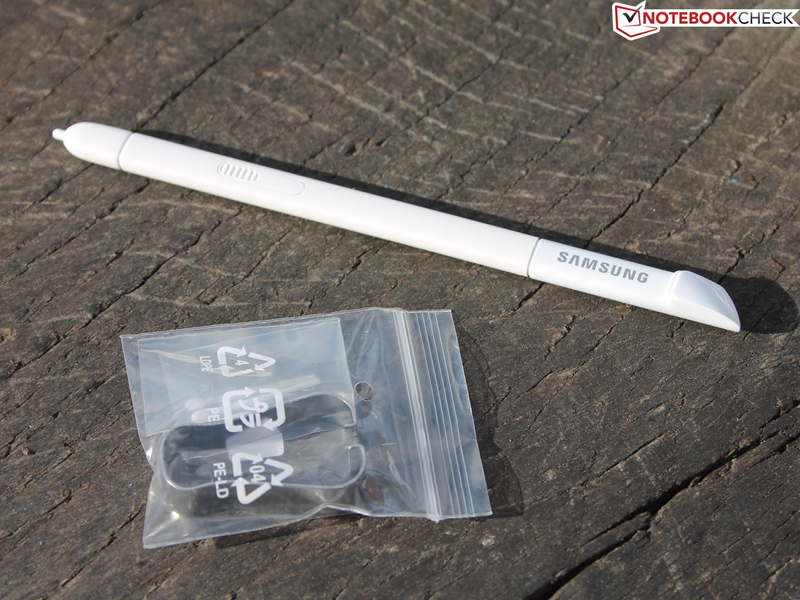 Two replacement tips are provided for the pen (S Pen like in the Galaxy line). 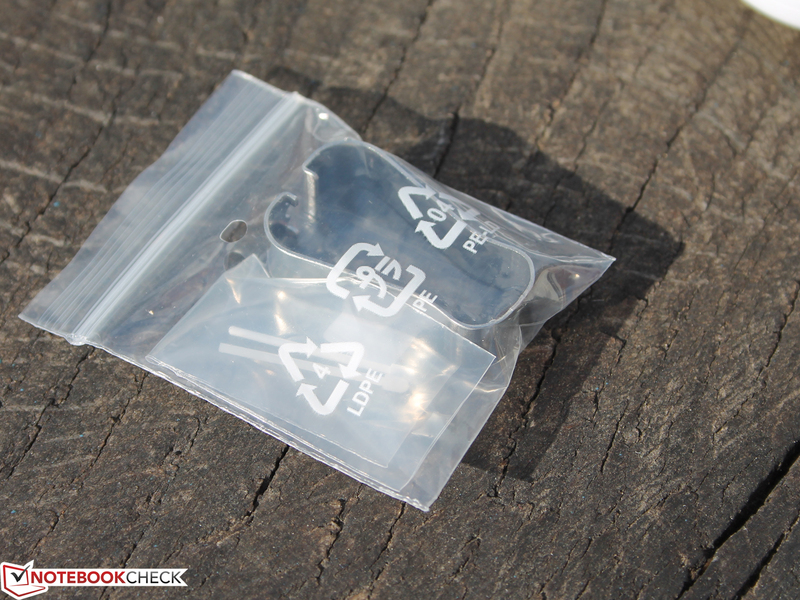 Aside from the pen only the quick start guides and warranty information are found in the box. Samsung includes a 24-month warranty with a pick-up service, where the manufacturer picks up the tablet, or send-in service. Either the hotline or a customer service assistant decides which service is applicable after registering a defect (Flexible Service). 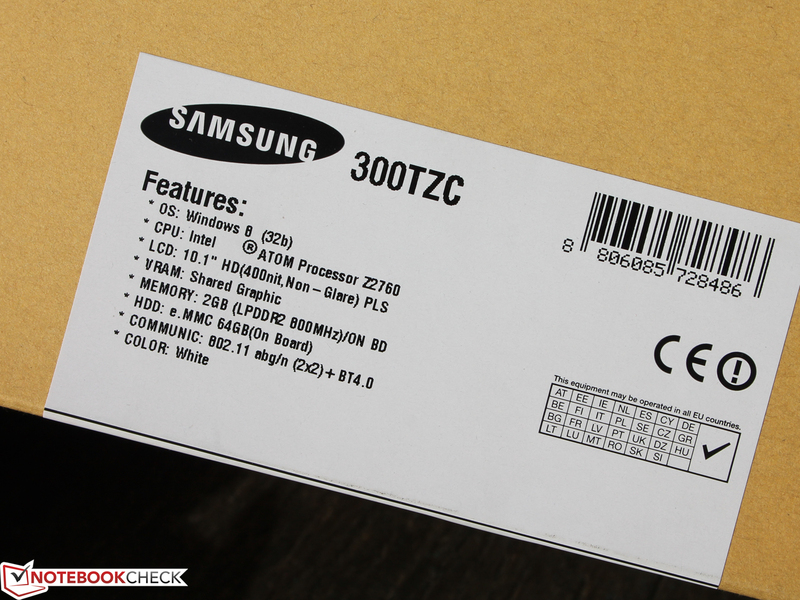 Like for its laptops, Samsung offers warranty upgrades (36 or 48 months) for its ATIV tablets for approximately 60 Euros. Service upgrades must be activated within 90 days after purchase. 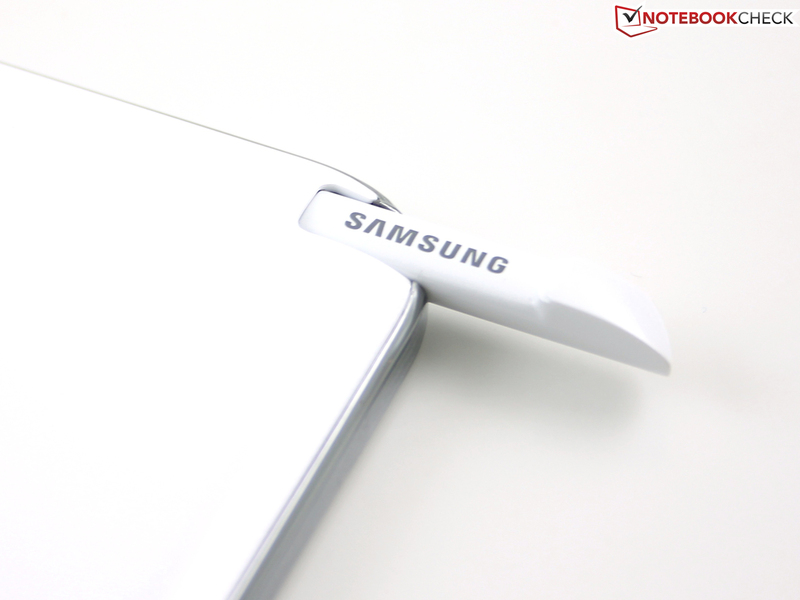 We have to admit, using Samsung's tablet with a finger or pen (S Pen) is first-rate. This compensates for the fact that we are dealing with a five-finger multi-touchscreen (10 fingers are common). Who draws or writes with more than five fingers simultaneously anyway? Handwriting was detected as a keyboard replacement flawlessly even in Paint and was implemented with an insignificant delay. As typical for Windows, the virtual keyboard can also be divided for typing with both thumbs. 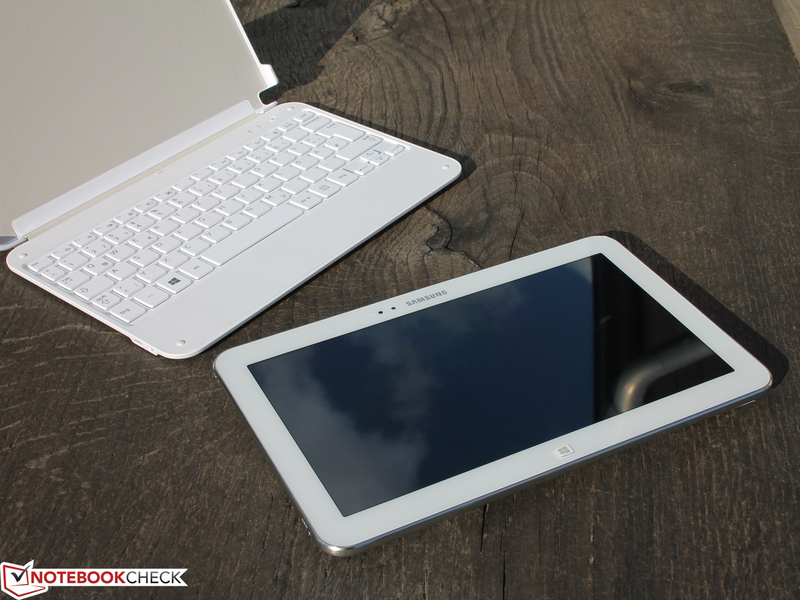 The ATIV Tab 3 is certainly not the first convertible or tablet that uses a (Bluetooth) keyboard. 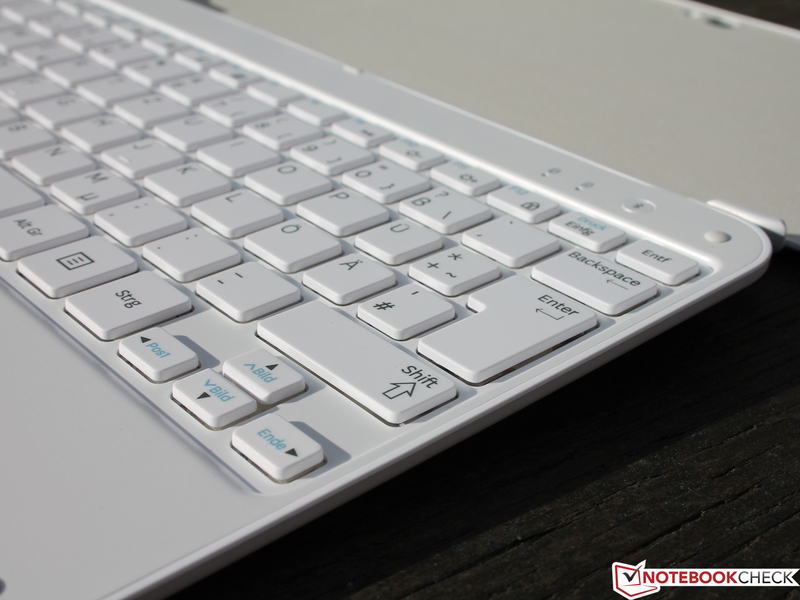 But it is definitely one of the best input devices that we have ever laid our hands on in such a bundle. The matte keys have an extremely clear drop, firm stroke (no hollow underneath the keyboard) and a distinct pressure point. Typing on the lap is still firm and stable, which is due to the keyboard's relatively solid underside. We find its layout featuring small, yet clearly separated arrow keys just as appealing. 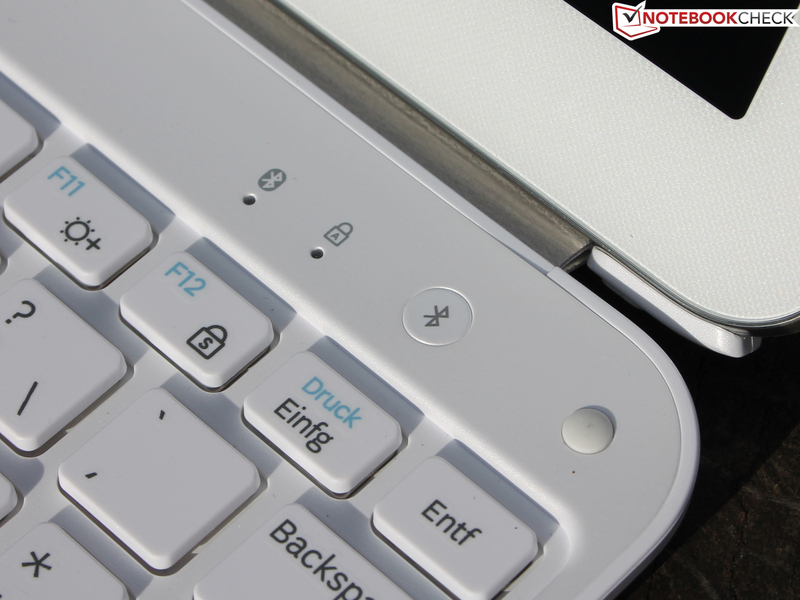 The function keys in laptop-style enable fast control of volume, brightness or play/stop. The arrow keys' secondary mapping with image and position functions is convenient as it saves time-consuming scrolling. The keys feature a long drop and clear pressure point. 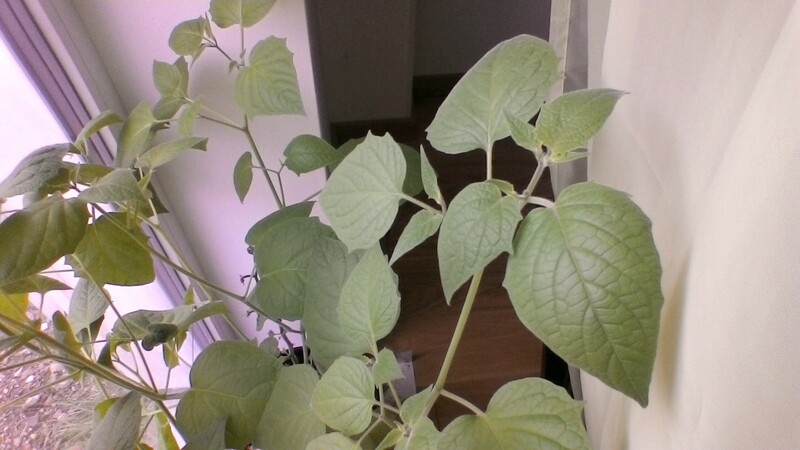 The S Pen is not only suitable for notes. The 10.1-inch HD screen (IPS, 1366x768) has an adequate resolution compared with its contenders. 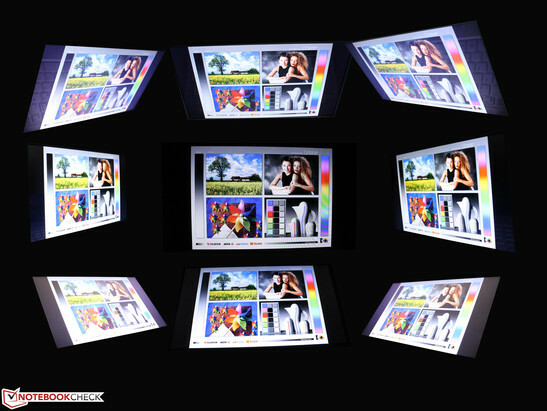 However, more is possible as the 11.6-inch Smart PC Pro proved with 1920x1080 pixels. The more expensive Intel Core systems usually feature the latter Full HD resolution, for example Acer's Iconia Tab W700. This might change in view of the new Bay Trail Atom platform. HP's Omni 10 5600eg (400 Euros, ~$541) is touted with a Full HD screen. Unfortunately, the contrast of 345:1 is not state-of-the-art although colors look quite crisp and fresh. The contenders do a better job here with contrasts ranging from 1200 to 1500:1. The IPS screen in Acer's Aspire P3-171 has the best brightness rate. The review sample's brightness is automatically adapted to the ambient light via the ambient light sensor located beside the webcam on the front. This leads to a brightness of 379 cd/m² in the screen's center (AC mode). This maximum rate drops to 240 cd/m² in battery mode (disabled sensor). Calibration was not possible due to a driver incompatibility (calibration failed, GMA driver does not support adjustable gamma curves, so-called video LUTs). Consequently, we cannot provide a color space comparison here. We assessed the screen using the CalMAN colorimeter via an external PC. Although the grayscale deviation is quite strong (DeltaE 4-10), the screen does not exhibit a bluish cast that is common for TN screens. Magenta shifts into the blue range, but in return green moves toward yellow (saturation). In sum, this results in a rather warm image impression that was confirmed with a measured white rate (CCT) of 6631. The brightness limitation in battery mode affects outdoor use quite strongly. Alongside the touch surface's intense reflections, using the tablet on sunny days is difficult up to impossible. A high brightness can lessen, but not eliminate the latter criticism. The screen's viewing angles correspond to those of IPS displays (in-plane switching). It allows wide deviations from a central viewing position vertically and horizontally. We could look at the screen from the sides, above or below at an angle of 85 degrees and did not experience ghosting or unwanted dimming. 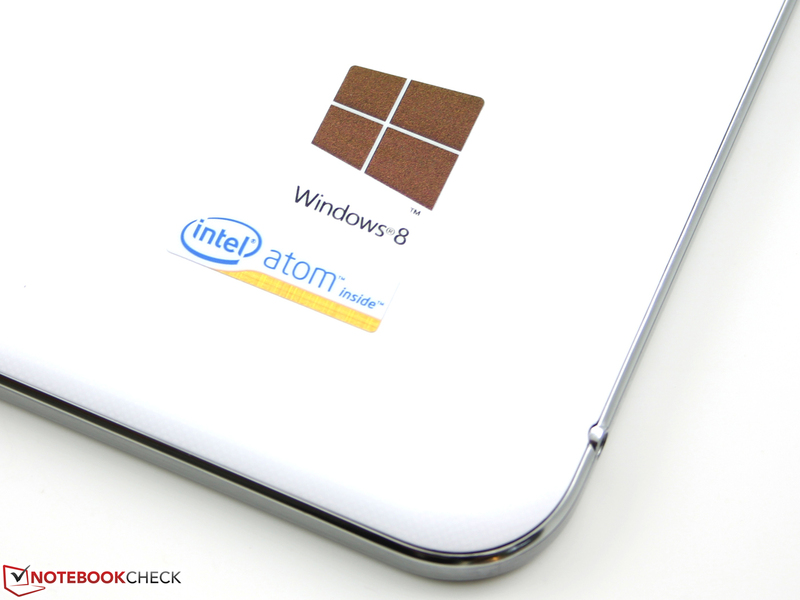 The Atom Z2760 (Clover Trail) was Intel's first response to the massive distribution of Nvidia Tegra and ARM SoCs in Android tablets. On the one hand, the chip is economic and scalable, and the x86 architecture can satisfy the Windows fan community. The Bay Trail successor was officially introduced in September 2013 and corresponding devices are now in retail. A 64 GB eMMC (SSD storage) and 2048 MB of DDR2 RAM (the platform does not support more) complete the low-performance bundle. The GMA 3650 is integrated in the processor and performs comparatively basic tasks. After innumerable Clover Trail tests over the past 12 months, we almost look wearily at the Atom system's typical benchmark scores. Since there is no Turbo, there are no major deviations between the different devices (like in Intel Core laptops). For this reason, we first look at Acer's Aspire P3-171, with its Ivy Bridge Core i3-3229Y (ULV), which calculates 93 and 193% faster than our review sample or Lenovo's IdeaTab Miix 10 and Lenovo's ThinkPad Tablet 2. The Aspire P3-171 represents the performance of typical office laptops or corresponding tablets with an Intel Celeron or Pentium (ULV versions). PCMark continues the Cinebench course, but the advantages for the Intel Core processor in the Aspire are not quite as big. Nevertheless, a 100% difference in the total and productivity score is a devastating verdict for the ATIV Tab 3's future-suitability. Who wants to buy a system that already works at its performance limit today? At least, this is how we experienced the speeds when copying files or simultaneously running installations. However, we cannot deny that the user will definitely be able to switch between applications and browse on the Internet in a conveniently fast speed on the tablet. Users who install MS Outlook or edit large pictures will soon find themselves wanting a fast laptop though. The flash memory does not turn out to be a turbo for the application performance, although we can say that the load and boot times are short. Both the IdeaTab Miix 10 and ThinkPad Tablet 2 contenders are slower in details (CrystalDiskMark). Our review sample completed the relevant 4K tests (read/write of random, small files) by 20 to 36% faster. This does not seem to help much in an overall assessment via PCMark 7 - Storage System; both contenders are again in the lead here. The Intel SSD 525 Series in the Aspire P3-171, which is at the lower end of the general SSD performance scale, is impressive in this comparison. 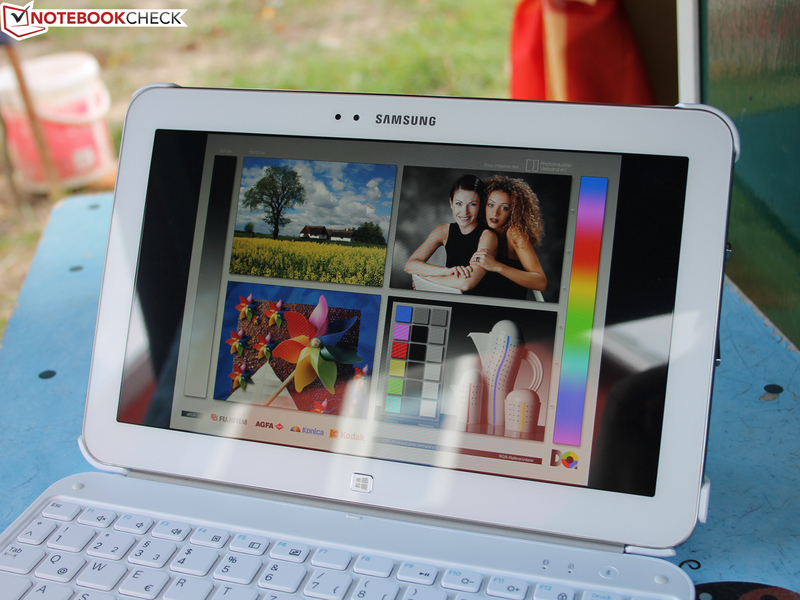 The Write 4K test recorded a 12 times faster speed than the storage in the ATIV Tab 3. Thus, Acer's tablet is also clearly in the lead in System Storage. The PowerVR SGX545 (IGP), or simply the Intel GMA 3650, is very far back in a comparison with Intel iGPUs or AMD APUs. The integrated HD Graphics in the Aspire P3-171 is six times as fast and the Radeon HD 6250 of the Z-60 APU is twice as fast. We also display the Pentium 967 (HD Graphics), for example found in Acer's Aspire V5-531, for an overall evaluation (almost 3x as fast). The platform is useless for games. Details about the tested games can be found in the specs of Intel's GMA 3650. The PowerVR SGX545 does not support DirectX 10. 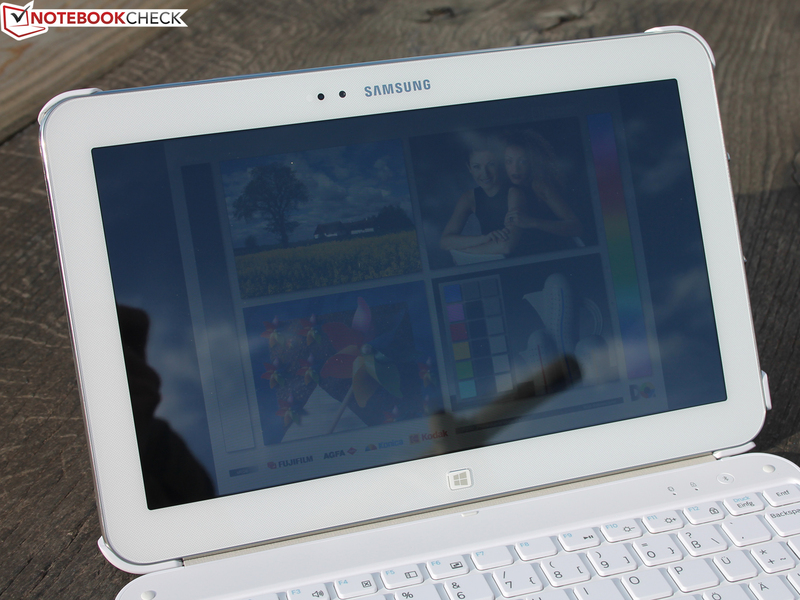 Like all Clover Trail systems, the ATIV Tab 3 does not sport an active fan and is therefore absolutely silent. The omitted fan is not a drawback for the possible temperature increase. 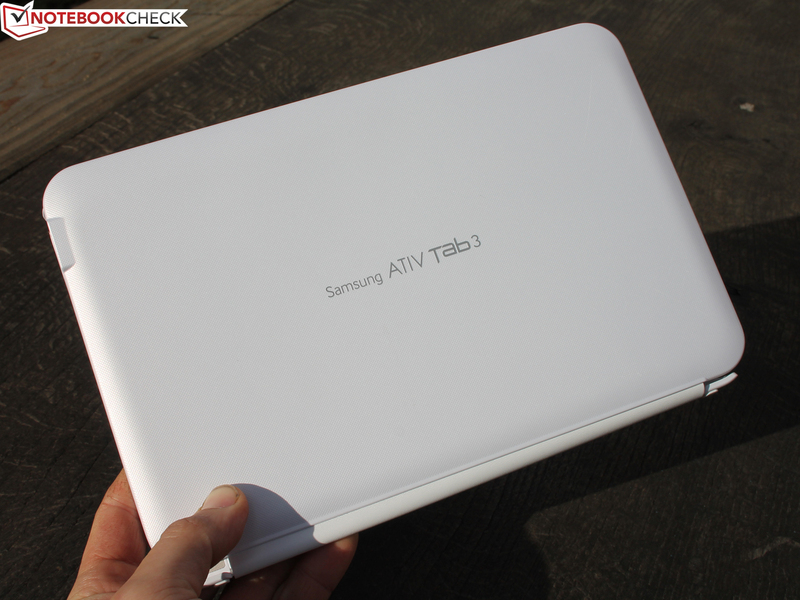 The ATIV Tab 3 is always within an inconspicuous, at most lukewarm range. The user will not experience any restrictions while using the tablet with a maximum surface temperature of 38 °C (100.4 °F) on the back and up to 41° C (105.8 °F) on the screen (ascertained in the stress test). Our stress test is also an unrealistic scenario that is to provoke the highest possible load. We measured the temperatures on the tablet's front and back and on the keyboard case while the device was inserted in the Book Cover. The keyboard dock remained at room temperature because it does not have circuits or a big battery. 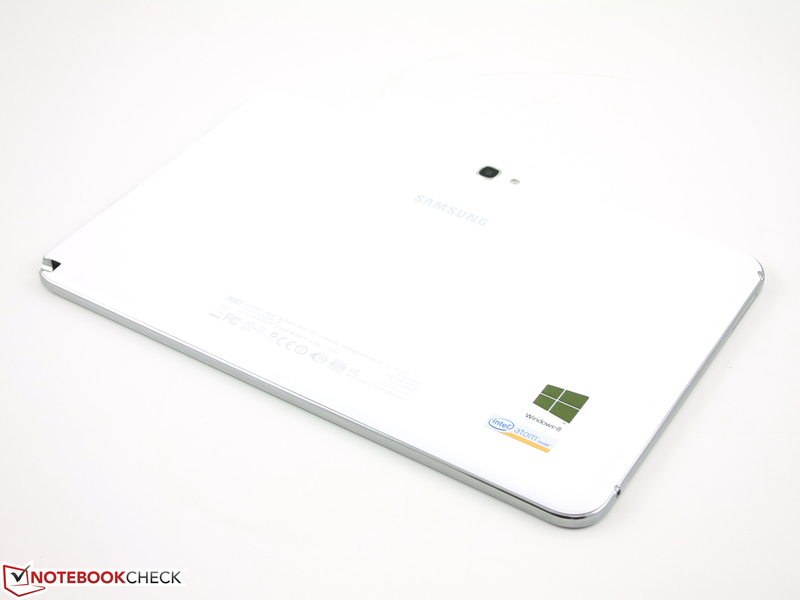 The ATIV Tab 3 ran the stress test (FurMark + Prime95) with a consistent CPU clock rate of 1.8 GHz. Looking at the waste heat of the contenders, it becomes clear why an Atom is quite useful in a tablet. Acer's Aspire P3-171, which we highly praised for its price and performance, reaches 20 to 30% higher temperatures on its hot spots. It also sports an active fan that produces noise, however low (Aspire's Noise Rating: 92% - Very Good). (±) The maximum temperature on the upper side is 40.7 °C / 105 F, compared to the average of 35.4 °C / 96 F, ranging from 21.8 to 55.7 °C for the class Convertible. (±) The average temperature of the palmrest area of similar devices was 29 °C / 84.2 F (-1.6 °C / -2.9 F). The Atom platform is simply energy-efficient. 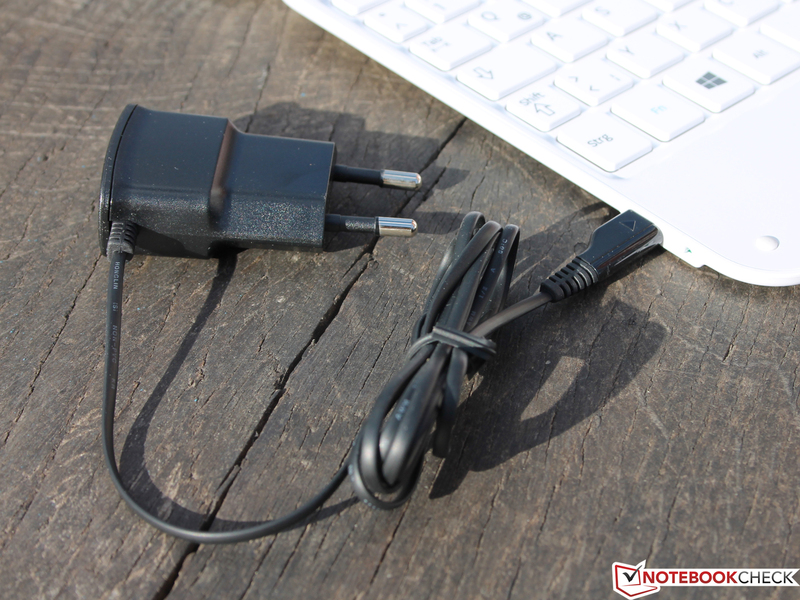 Like the Lenovo models, the power consumption at the dock is 1.8 to 4.5 Watts (max./min. idle). The Aspire P3-171 consumes 8 - 11 Watts in this mode. The same is seen in medium load (3DMark 2006 or 2005) where the Aspire demands 24 Watts in contrast to the low 6.6 Watts of the ATIV Tab 3. The 40-Watt power supply seems completely over-sized in view of this power consumption. It is also barely loaded and only reached 32 degrees (89.6 °F) even in the stress test. 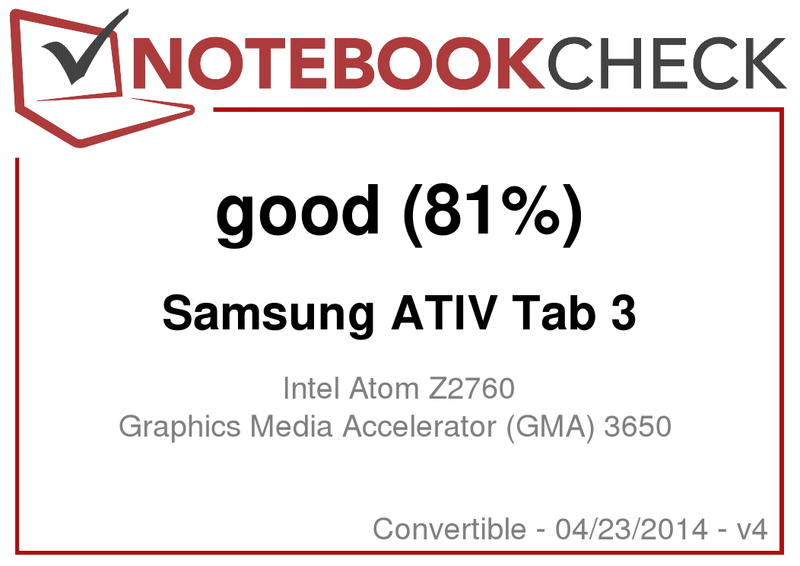 The ATIV Tab 3 beats all three contenders in Runtime, no matter if they are based on Atom or Intel Cores. It finished the Reader's test, using disabled wireless modules and minimum brightness, after 17:46 hours. The Wi-Fi test stopped after 7:20 hours, which is also a good time. Acer's Aspire P3-171 only lasts for 71% of the time in the first test and 36% in the second. The Atom contenders are also defeated: the IdeaTab Miix 10 only lasts for half as long in the Wi-Fi test and the ThinkPad Tablet 2's runtime is 30% shorter. Too late and too expensive. 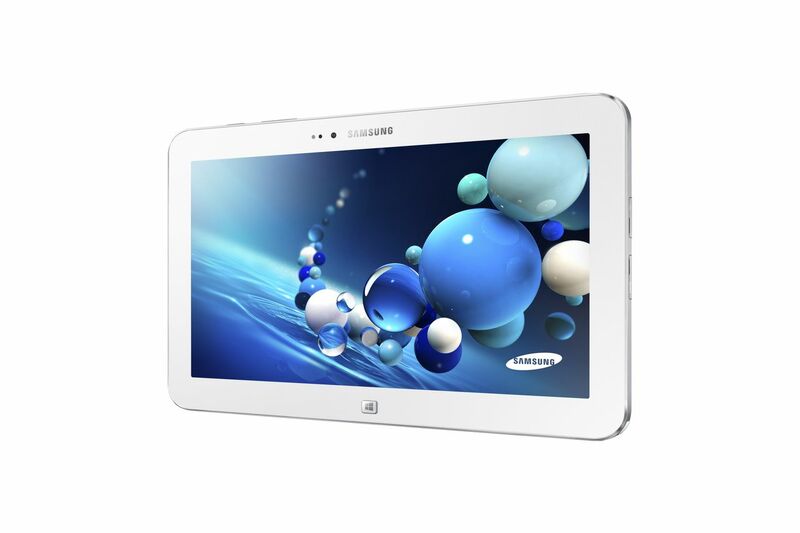 Samsung launches its ATIV Tab 3 on the market at a time when Intel's new Bay Trail Atom platform is hitting the shelves. We have not yet tested Bay Trail, but Intel states a five-times higher graphics performance (HD Graphics) and two-times higher computing performance (quad-core) compared with the Clover Trail platform here. Considering the price of 770 Euros (~$1041, w/ dock) and the devastating performance outlook pertaining to the use as a portable Windows office, we ask ourselves who would buy the tablet now. Asus lists its 10-inch Transformer Book T100TA-DK003H (Intel Atom Bay Trail) for currently just 380 Euros (~$514, sales launch). Together with a keyboard dock, it is price-tagged at an affordable 400 Euros (~$541). 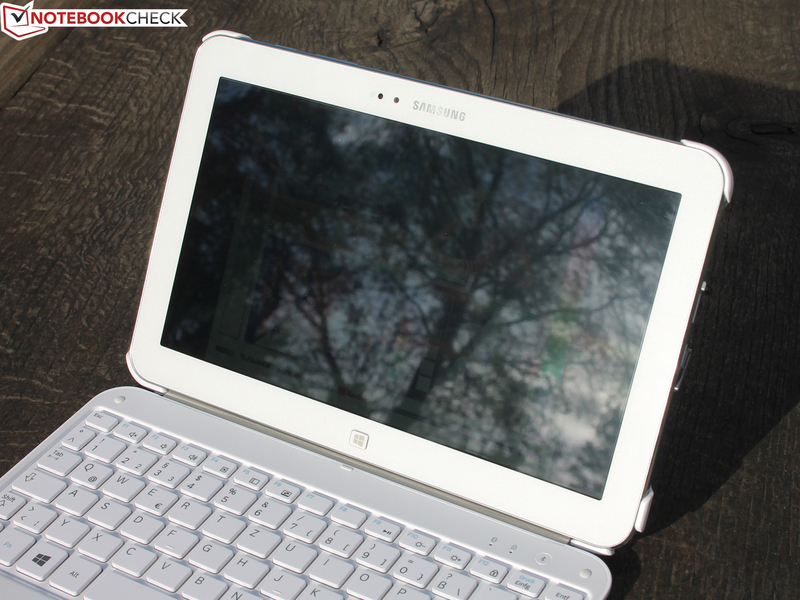 Regardless of the price debate, the ATIV Tab 3 is a good blend of portable tablet comfort and work-suitable keyboard. Users who type masses of emails or chat correspondences will experience high feedback. The dock's clever stand keeps the display in position, not to mention the long battery runtimes of 7:20 (Wi-Fi browsing) to 17:46 hours (idling). The ATIV Tab 3 will suit everyone who is looking for an uncompromisingly good mini-keyboard in connection with an economic as well as a handy Windows tablet. Users who are expecting the power of a laptop should back away and take a device with an Intel Core processor. A list of appropriate contenders can be found in the sidebar; we deem the Intel Core systems to be particularly recommendable. 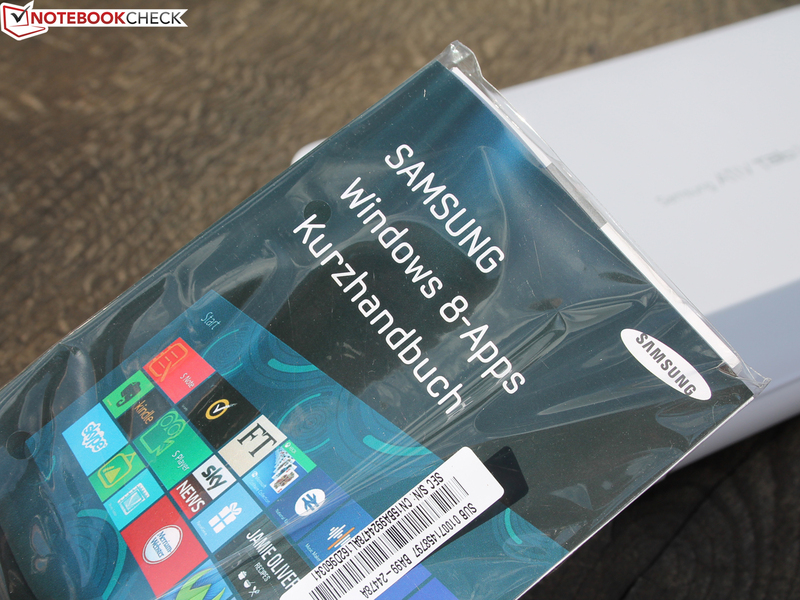 Samsung sells Windows systems under the umbrella brand ATIV. The manufacturer not only has ARM-based Android tablets besides it Galaxy models in its program. ...using Windows 8 are very limited (compared with Android). We no longer ask whether a resource devouring Windows 8 OS is too big for this processor in this test. ...We have already answered this question with a clear "yes" in many tests. Samung equips its 10.1-inch ATIV with a stylus (digitizer pen). 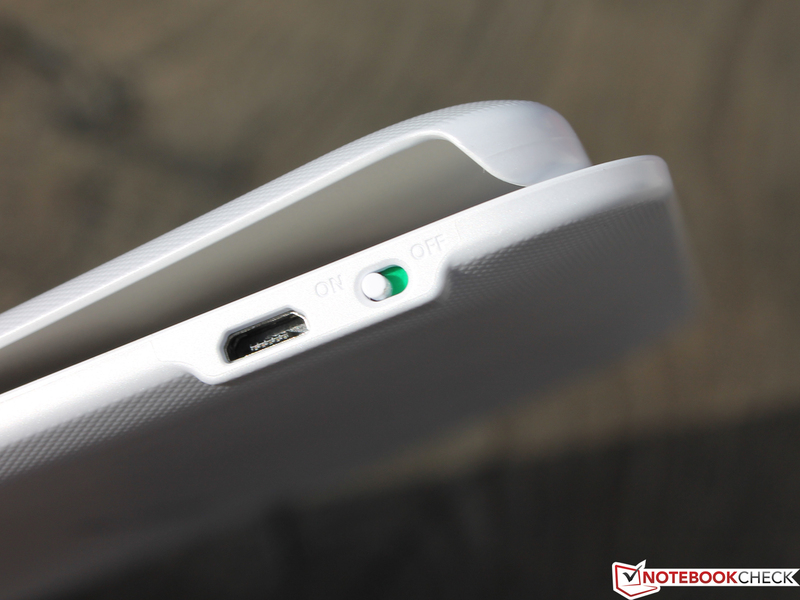 Besides that, interfaces like micro-SD and a micro-USB are installed. The treble-heavy sounding speakers are on the casing's sides. 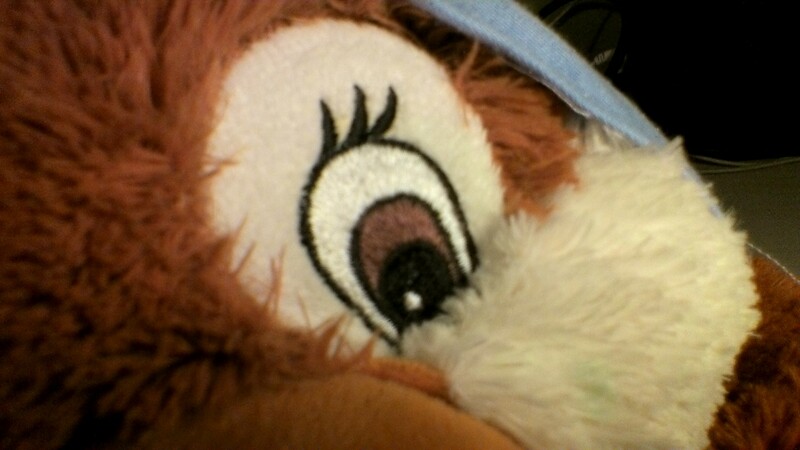 Good: Two webcams (here: front), one with a flash. 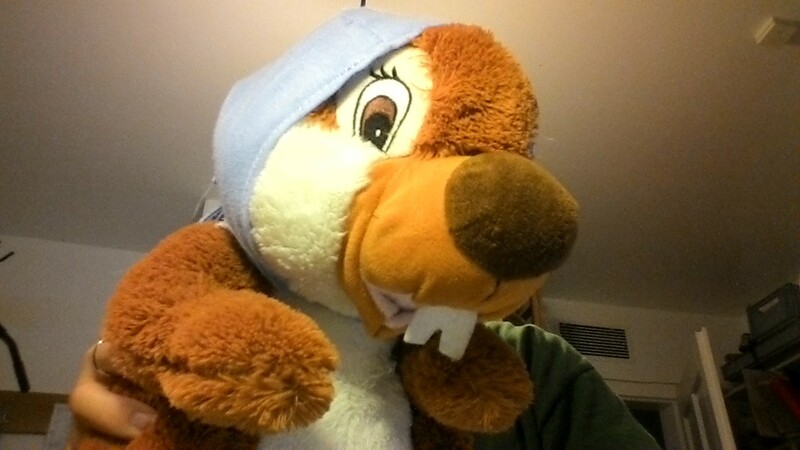 Bad: The quality of both camera modules. 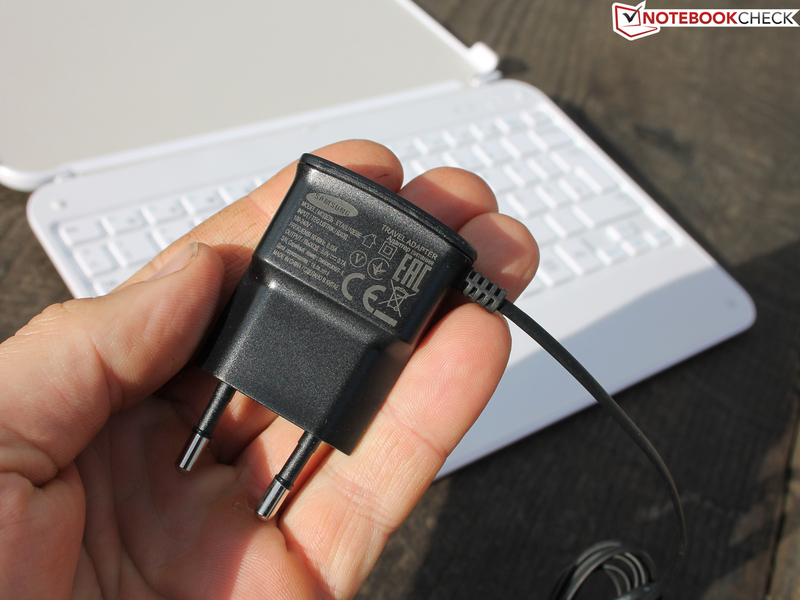 The keyboard dock (AA-BK1NWBW/DE) with a battery, transmits via Bluetooth and is recharged with a dedicated power supply. Steep 90 Euros is charged for the Book Cover keyboard in retail sale. In return, its quality is very good. We particularly like the keys with their good feedback (clear drop). The case securely locks with the tablet. These corners keep the tablet firmly in the case. However, it is also easy to remove. Bluetooth communication can always be disconnected. 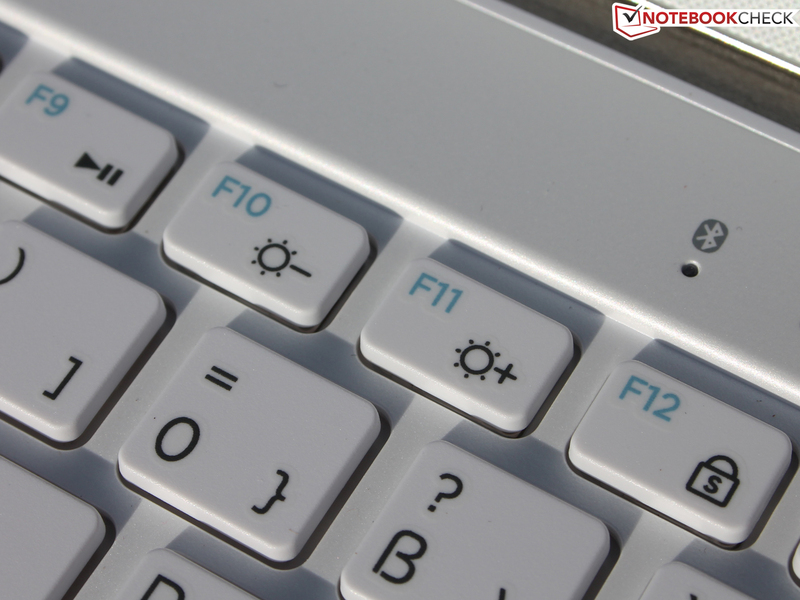 The keys have the usual laptop layout with function keys for brightness and volume. 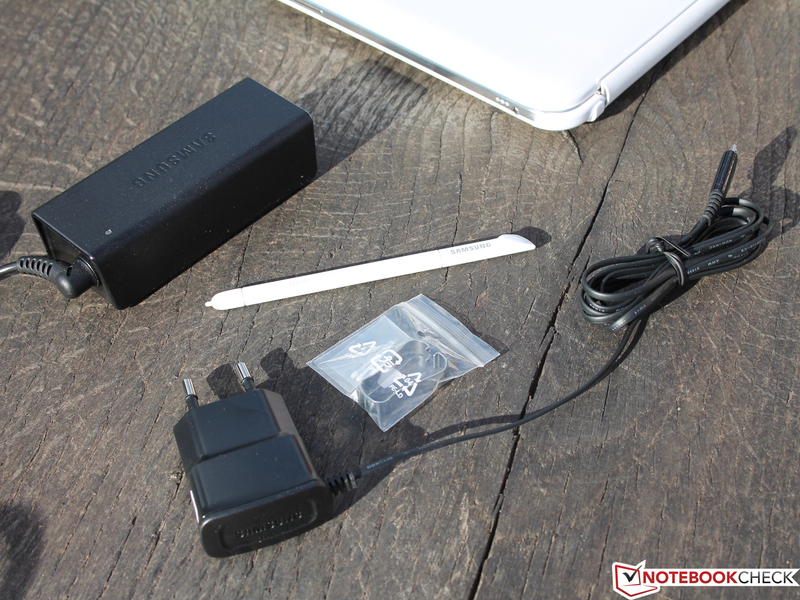 The accessories are comprised of two power supplies (smaller one for the keyboard) and a stylus inserted in the tablet. The viewing angle stable, HD screen. The digitizer pen and the feedback-strong keyboard. The magnetic-locked stand is nifty. First-rate camera modules for less noise and good focus. The results are miserable even in daylight. Performance for Windows applications that goes beyond Internet browsing. As a work device, this Atom platform is not viable for the future. The steep price. Acer sells its Aspire P3-171 for less and it also comes as a convertible with a keyboard case. 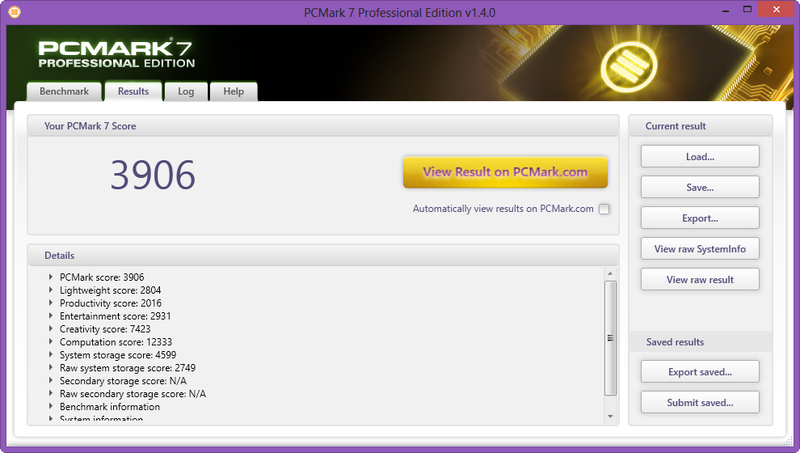 It is considerably more future-suitable for serious Windows users with an Intel Core. 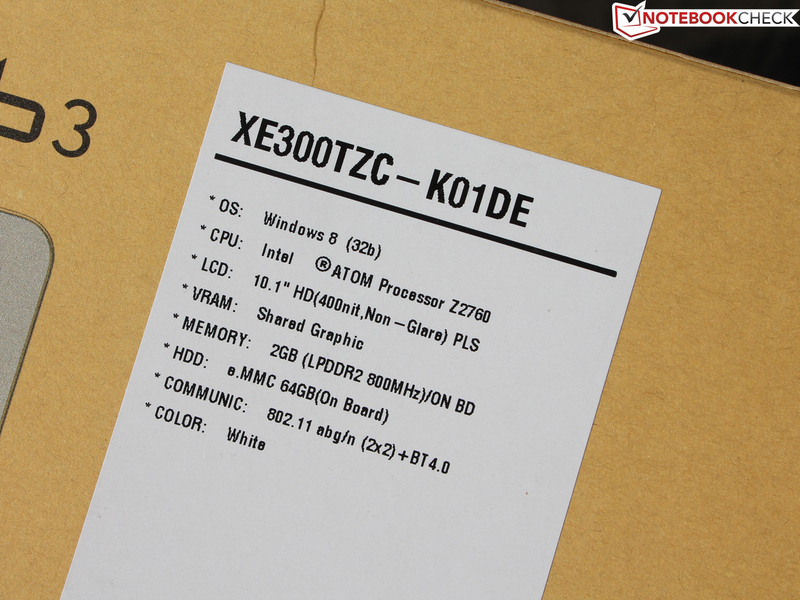 Some other Atom contenders only cost 400 Euros and Intel's brand new Bay Trail Atom is listed with a similar price.